I am now coming to an age when I have lots of memories, like a basket of chestnuts to turn over a bored fire. Some memories are painfully embarrassing, though I suppose I should enjoy it though; this is the marrow of my life, and those days are not coming back. Which is sometimes for the better, as there are certain things I don’t need to live twice. Like the first concert I went to…. And I mean real concert, real music. Nothing instrumental, where you sit in a climate controlled environment on red velvet seats. I grew up with parents who sang and played piano, and the trumpet, respectively. I joined the church bell choir when I was 10 and felt so grown up. I picked up a flute for the first time when I was 11 and played for eight more years. I had been to symphonies and ballets and musicals. I wanted something sweaty and tie-died and photographed so people could see it later and I could be cool. I fell woefully short. 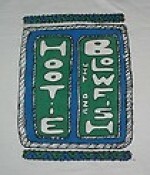 I went to Hootie and the Blowfish. My friend Kent was about to leave for a semester in Japan, and he, his girlfriend Andrea and best friend Brian and I all went out the large amphitheater to see this show. I had envisioned throngs of people pushing to get in and hawking tickets. Instead, it was a calm and sunny middle-of-the-afternoon show. We filed in calmly and handed over our tickets. But we were still being cool. We were at a concert. We were going to go on the other side of the hill and jam out on the grass in the sunset and meet loads of other people enjoying the same. We made our way around the hill, and I remember being handed flyers, advertisements, for different things. I felt very “in-the-know.” We got around and sat in the grass, and it wasn’t what I thought. There weren’t too many people there and we were just sitting there in the sun. I remember feeling like: “Now what?” It was so anticlimactic. By a unanimous decision, we left early and went to get something to eat at KFC, my high school workplace. I did buy a shirt to prove I was there, envious of all the cool kids in my high school hallway who wore concert t-shirts. And I thought Hootie would be the way to rectify that. I never wore it. Remember the time… I only wanted to be with you? Today's Guest Blogger is Sara from I Didn't Just Wake Up This Morning with a Craving. If you loved her piece as much as I did.. then let her know and check out her other masterful posts on her blog today!